When I think of a potluck, I always think of retro parties, house wives in crinoline skirts and homemade martinis. Some say that the term potluck comes from an unexpected guest who shows up for dinner and gets the luck of the pot. But I think it’s better to think of it as “lucky guests that will get a delicious one-pot meal from you”. In recent years, they have become more popular, as many fun retro traditions. The key to making a great potluck meal is a one-pot dish that is filling and hearty enough to feed a crowd. I try to stick to dishes that most people know and love, but I also enjoy putting a twist on the classic that will make it new and special. Chicken Enchiladas: I add spinach to boost nutritional with out drastically changing the flavor. Gooey cheese and chicken make it a classic. Spicy Sausage Lasagna: Turkey sausage adds meatiness without overloading on fat that you get from your standard pork sausage. So dig in! Scalloped Potatoes: Scalloped potatoes that are crusty on the top and creamy in the center are a favorite for special occasions. This version is healthy enough for every day with skim milk and low-fat mozzarella. Devil’s Food Cake: Most people love old fashioned chocolate desserts with creamy icing and this cake fits the bill. Coffee in the batter accentuates the chocolate flavor without adding an fat or calories. 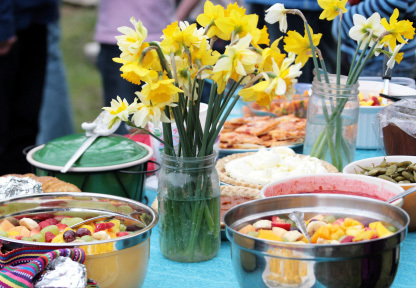 What’s your favorite potluck recipe, and what are your favorite potluck ideas? Leave your answer in the comments below.